The show is up. The show is on. Last night the final installation phase went down (you could possibly read into this that I didn’t have all my stuff together for phase 1, which could have been the only phase). However, if you’re feeling generous, perhaps it would be more beneficial to think that I’ve got such a lot going on and I am trying my very best. So. It’s all there, lined up and looking like it was meant to be there all along. I did aim for that outcome; had the HULA logo beside my work desk the entire time to ensure that my colours gelled with theirs. All the originals are for sale, bar the one that already sold. 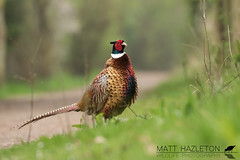 There are also high quality giclee prints for purchase. To mark the beginning of Edinburgh’s vibrant Fringe Festival, Hula is proud to be hosting a night of art and enjoyment. 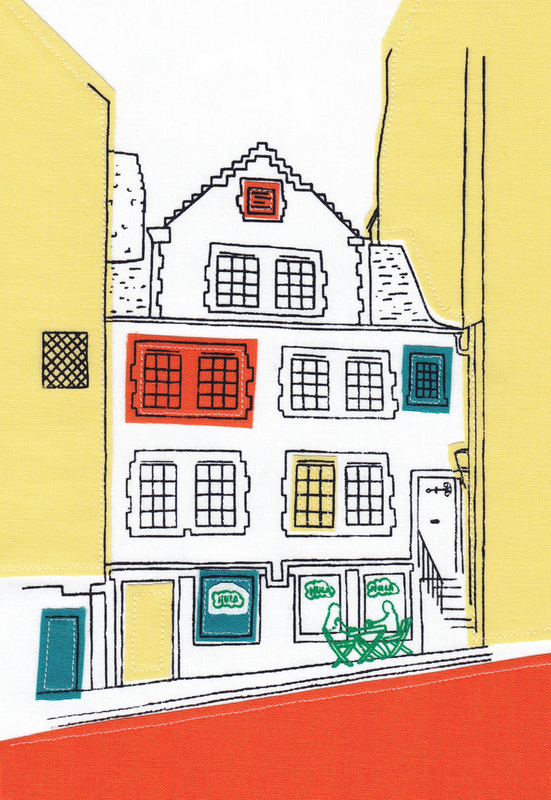 In celebration of this city’s beautiful and iconic architecture we will be exhibiting a truly unique collection of print and textile art depicting the beauty of the Grassmarket from local artist Cassandra Harisson. All of the artwork on display will be for sale – including the originals and the limited edition prints – apart from Hula’s very own commissioned piece that will remain in the café forevermore, something that we are very excited about! There cannot be a doubt that this will be a very special night for Hula. In accordance with this theme we will be serving delicious snacks (straight from the Hula menu) and some not-to-be-missed rum punch. For your musical enjoyment The Edinburgh Samba School will be joining us at the start of the evening. Later in the evening Megan Davidson will be making a Grassmarket debut of her acoustic talents. We hope you can join us, there is limited capacity so please RSVP here. If you are unable to make it, the collection will be displayed from the 20th of July until the 1st of September so feel free to pop down and have a look. At one point in your life, I’m sure you’ve felt like you’ve been on that wheel. Running forward, running faster, but where exactly are you going? Towards exhaustion and collapse, I would imagine. For the past several months I have felt that this has been my view, from inside the wheel as I run faster and faster. But where am I going? It is because of that feeling of running and getting nowhere, that I finally decided to book myself in for a little meeting at the Cultural Enterprise Office in Edinburgh. Earlier in the year I had attended a seminar – not sure that’s the word for it – for mid-career artists. It was a day of listening, learning, and trying to find new ways of seeing new options for your creative career, as well as hearing inspirational stories, hearing behind-the-scenes advice from gallery curators and so on. And it was free! With tea and coffee and snacks. I’m such a sucker for free coffee and snacks. Although I had taken notes and had personally followed up on some things learned, I still felt like I was working very hard, but not necessarily very smart. And so I booked myself in for this meeting. And wow. I needed that. I am happy that people like my artwork. I am happy that I can scrape together something of a living doing what I love. I’ve worked very hard to get here, trying to develop good relationships with boutique shop owners and gallery owners as well as listening to the specific needs for clients that commission work from me. I have worked hard over the years to come to grips with my way of artmaking, refining the skills needed to get those blasted Gocco screens to work, reducing failure rate to only 1 out of every 10 not working out. I’ve found two trustworthy suppliers, one in the states and one in Japan. All of this has taken time to learn, to find out, to research, to experiment. My work is created in several stages. First, I wander around with camera and sketchbook, view and snap photos of angles, up streets, down streets, try to get the general feeling of the place. When I decide on the image I want to use, I draw it using steady lines, calm breathing and a carbon loaded pencil. It isn’t just a quick drawing. Every line is considered. Retraced three times, changed, erased, re-drawn. Traced over again. I then create my screen from this drawing. Then there is the actually printing. I go out, select my fabric, bring home, cut and iron the pieces. I usually prepare 20 to 30 pieces of fabric, knowing that from the batch, only about ten artworks can be made from those. 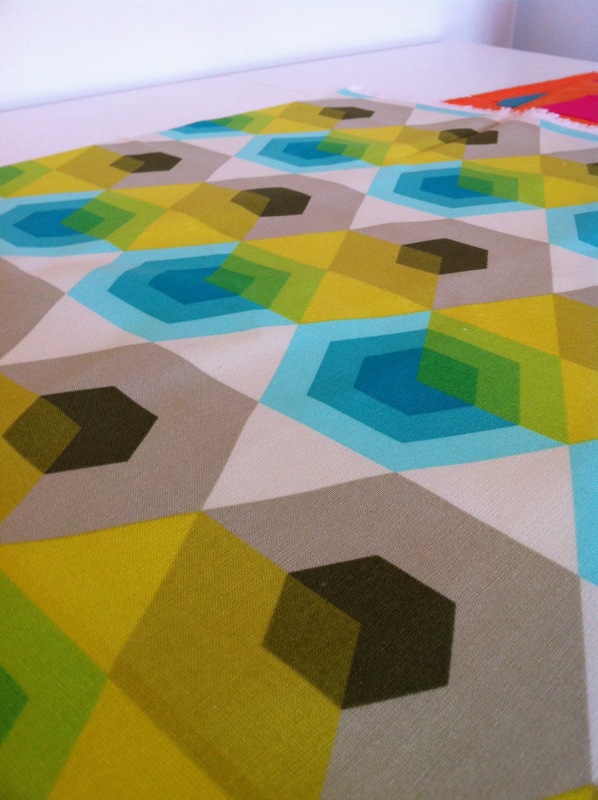 So, I put aside a big chunk of time and print on white fabrics and colour fabric that I think will work well together. After the pieces dry, I then sit down to cut and sew and recreate the scene all over again. So. Why is it that when I consider how to price my originals, why do I only count the time I spend sewing the bits together????!!! I have been doing this for years and only just realised my big, gaping, massive mistake. When previously I thought ‘Oh, well, it doesn’t really take me that long to get an image and oh, it only really takes me half a day to draw it out, sometimes a full day and oh, the printing, well, I don’t think that takes too long so really, it’s just when I sit down and piece the work together, I mean, yes, I should just count that time and so I’ll ask for some ridiculously small amount of money to cover that.’ Or something like that. And this isn’t even counting the time it takes me to drive around the galleries and shops to deliver pieces, something I do once a month. Or packaging up the work. Or even going to the fabric shop to buy supplies. None of this has been counted. But these are hours worked. These are minutes spent that add up to the end product of a framed finished work, printed with care and stitched with love. All of this goes into a 5″ x 7″ Edinburgh Skyline or whatever my kick is at the moment. At this meeting I attended, calculations were made and the dawning realisation hit me. I don’t spend half a day on one original artwork. I spend a day and a half making that original artwork. Sometimes more. Sometimes slightly less. But that is my time, that is my experience, that is my energy. So, what I’m trying to say here, is that things need to change. Running on that wheel is not helping and one way in which I need to work smarter is to reconsider the pricing of my work. 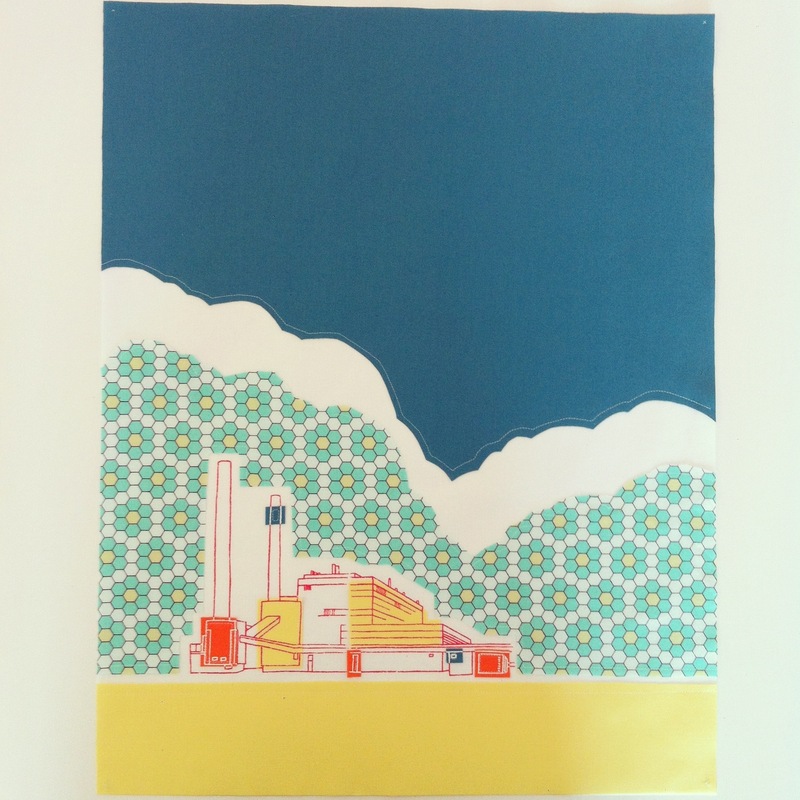 I am also going to explore new ways of creating prints that span a broader price range, so that if an original is desired but isn’t necessarily affordable, there are other options. Now. How to move forward with this. That’s the new thing I need to consider. The above work is a photo of a piece I finished just moments ago. This piece will be happily hung up on the wall at Urban Outfitters for the August exhibition. My lack of blogging is due to the manic work pace I’ve found necessary to keep to ensure that all pieces are finished on time for both the Hula Juice Bar gallery exhibit and the UO exhibit. These are great opportunities…these are great opportunities…these are great opportunities. I know this. I’m thankful. I just need to tell myself this when I start getting stressed and go insomniac. All of this hard work now will pay off in two groovy little exhibitions in my not-so-distant future. This is what I told my Dad: I’m practically killing myself now in hopes that it will pay off in the future. My dad’s response: You’re thinking like a farmer! A farmer?! Never in my life have I thought of myself anything like a farmer. Today I am off to have a chat with designer guy at Edinburgh Copyshop. There are postcard flyer invites to create. Large artworks to scan to be made into giclee prints. And a funky poster. Must not forget the funky poster. As for the rest of the UO artworks, I won’t be posting any more photos of completed work as I want the majority of the show to be a delightful surprise. However, I will post components of the pieces to give you an idea of where this is going. Many thanks for following along and thank you for your encouragement. What ridiculous hour is this? The sky is already light, in a dull gray-blue overcast tone. There is evidence of rain as the cobbles are looking wet and slick. From what I can tell looking out my window at the other windows of homes up and down my street, no one else is up. Good for you. Sleep on and sleep well. I’m totally envious. I think I’ve been awake for at least an hour already. In no particular order, here is a list of the things I need to do: Create one last screen for Hula, print, print Edinburgh Skyline in Hula exhibition colours, scan all Hula works and make four into postcard size prints to sell, order mounts for Hula works, take down artwork from I Heart Cafe, buy fabric for Hula and Wedding Invite Commission, print Wedding Commission artworks, make Wedding Commission artwork, scan and print into invites, order bespoke frame for Urban Outfitters chevron artwork, contact Dave at Edinburgh Copyshop to get a quote for postcard invites, do the same for man at ECA, buy frames for Hula artworks, confirm final details for UO exhibition and order postcard invites, download something I keep getting pestered about downloading but haven’t had time to download yet, re-install my printer to new laptop, book a hair appointment, disappoint friends by cancelling dates to meet in July or August, update website, update Etsy site, buy dog food, buy human food…uhm, I think that’s it. I think that’s the list that has been keeping me awake. Sometimes I get so desperate for a good night of sleep. A full night of sleep. One that doesn’t start with me lying there for an hour or more, wishing I was asleep by now and one that won’t have me up for hours in the middle, wishing I was asleep. I’ve downloaded ‘Sleep’ apps to help lull me into a deep sleep. They worked for a week but now I somehow seem to be immune. Not sure what the answer is, but am sure it isn’t sleeping pills. Maybe I just need to deal with my stress better or maybe this is just a particularly rough patch I’m going through. I am thankful for the opportunities that have found me, or I found them. I just wish they’d stop keeping me awake at night.